Nike is one of the biggest global companies. 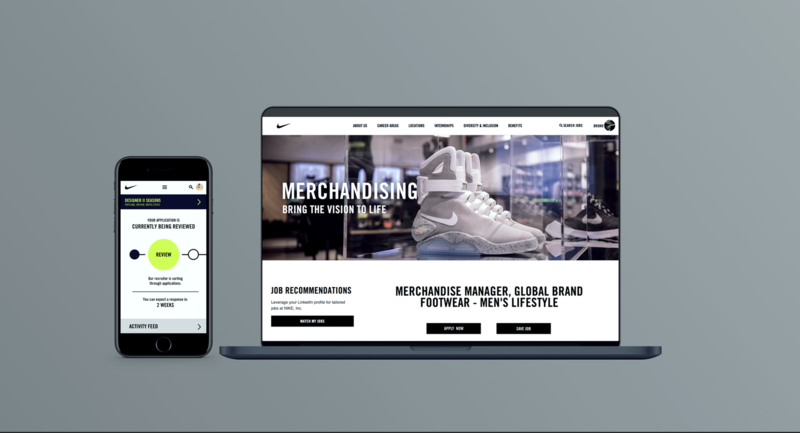 Recognized as a trend brand, Nike wants to be seen as a tech company and to hire persons that could work on google, facebook or another tech company. 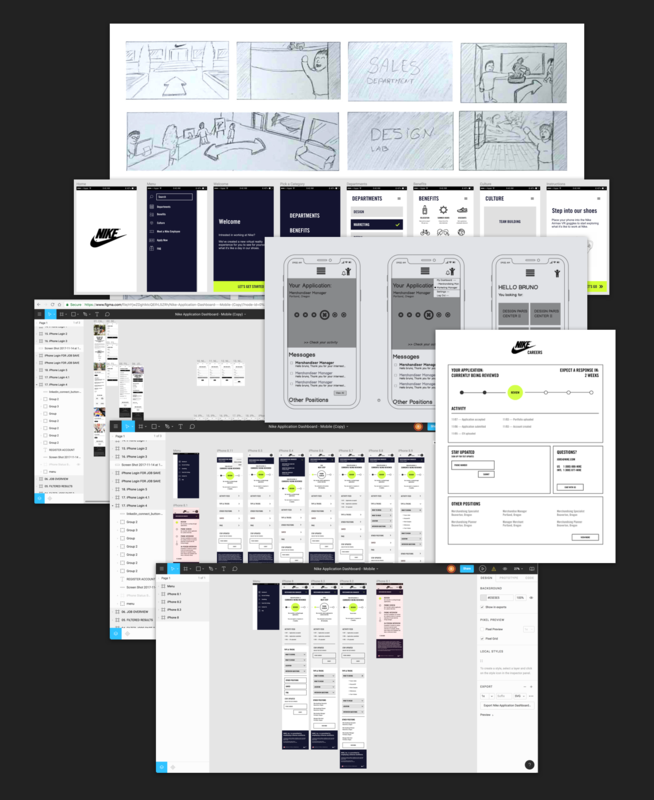 I've worked on a research to understand what the potentials applicants expect from a hiring process and propose some solutions to improve the process and help to change the perception of Nike as a tech company. 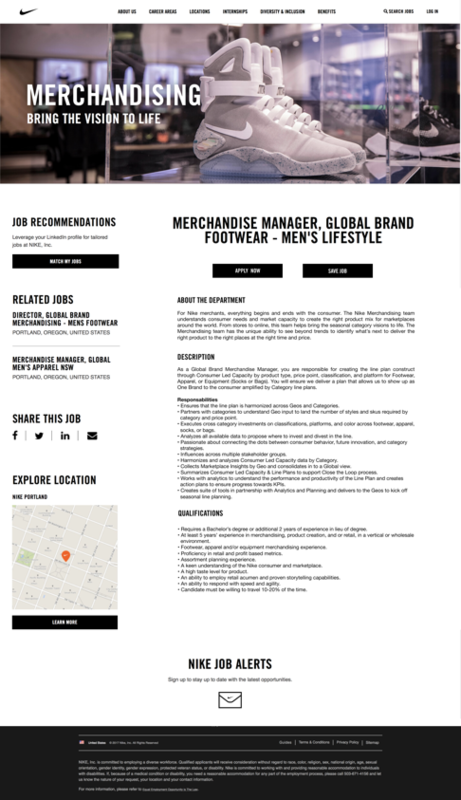 In this project, the mission was to engage more talented people and create awareness that Nike is a good place to work. 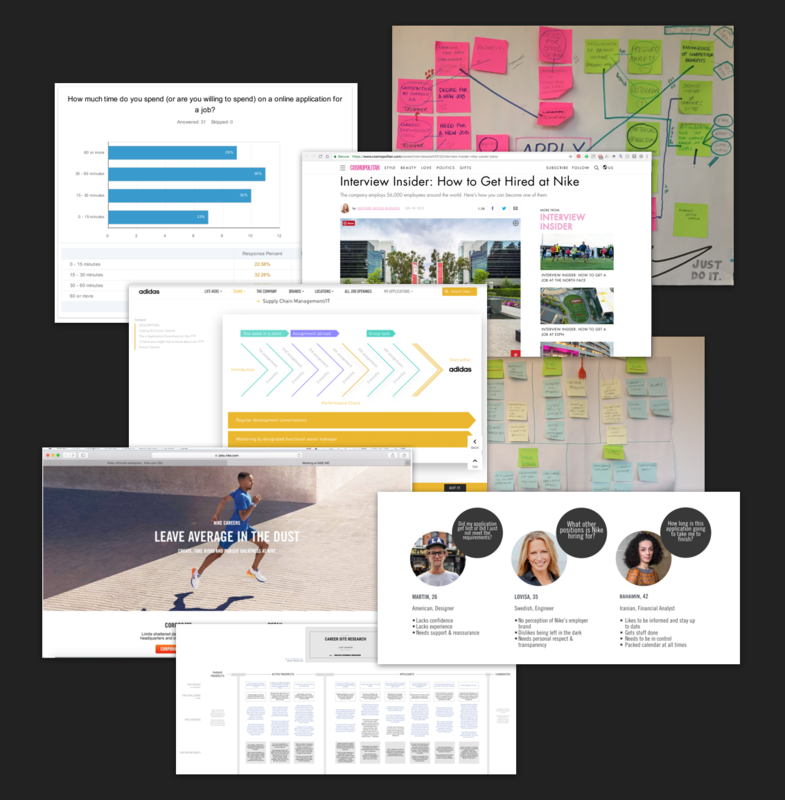 The first step was to understand the current flow of the hiring process and recognize some problems and focus in one solution to transform the experience of the candidate more smooth. 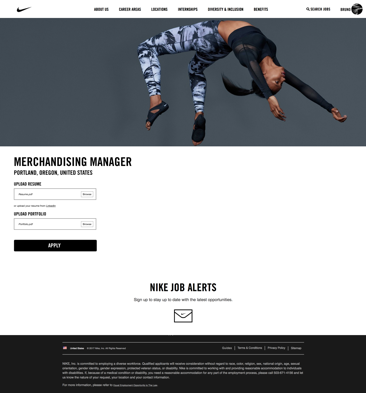 • The brand disconnect between jobs.nike.com and Taleo. • No transparency throughout the entire process. functions outside of Fashion & Athletics. 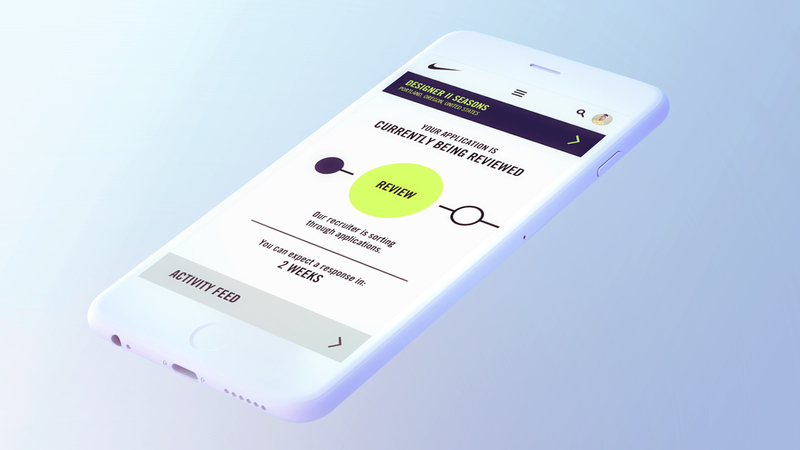 "How might we create a candidate experience that rivals the NIKE consumer experience?" • Candidates want transparency when applying for a job. • Candidates like personalization in the recruiting process. 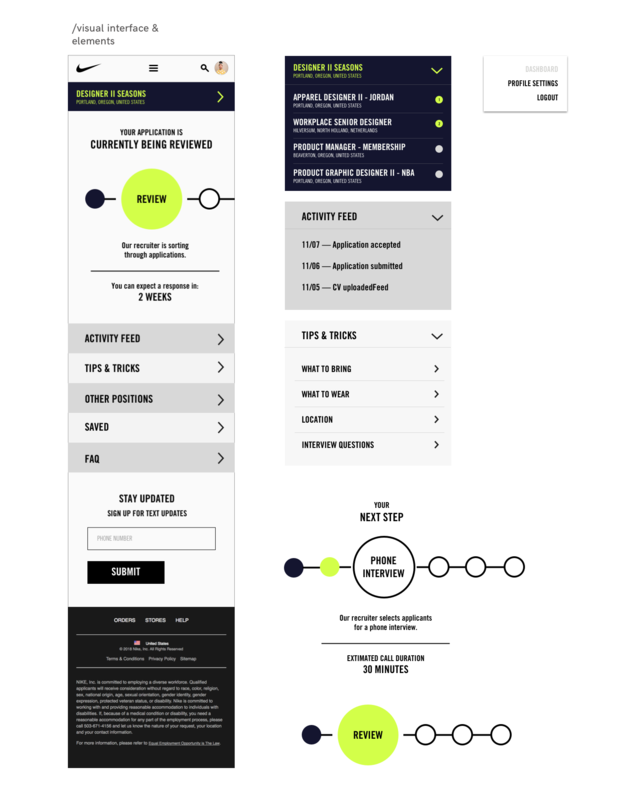 This solution was proposed to solve the Taleo problem, with a simple button, the applicant is redirected for a simple process that uses the information by LinkedIn and turns the process more simple. And the option to save jobs, if the applicant closes the browser, he can back to apply for your time. _ It enables candidates to upload their information in one click. _ It allows them to save job listings to their account. _ It gives applicants the option to choose what type of material to submit — resumé, portfolio, or LinkedIn. _ It removes as many barriers in the application process as possible. _ Menus are condensed, making navigation smoother and information easier to access. Based on the insights that candidates desire transparency and personalization in the hiring process, the dashboard was developed as one platform to candidate monitors his application and receives feedback and tips to continue a good process. 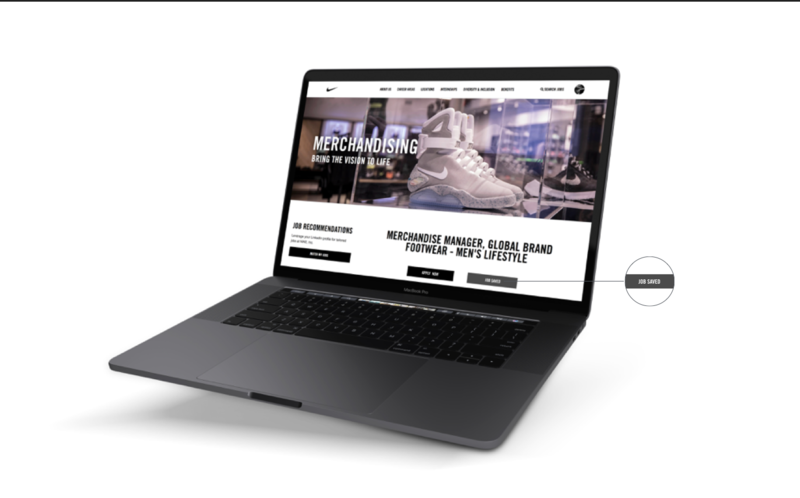 It's a simple solution that Nike can create a channel to connect with their future employees. • The application process is shorter and simpler. • Transparency throughout the entire process. • Real-time updates accessed through a comprehensive dashboard. 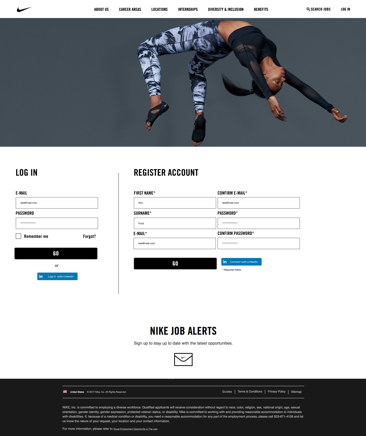 • Now, there is a motivation to continuously engage with Nike as a potential employer. The challenge, that I propose to myself as project manager, helps me to understand my needs and how to manage my team to get them to do their best in the job. Work in a horizontal structure, empower everybody and each one start the awareness of his paper on the process.